Since 2007, instances of rhino poaching in South Africa have increased by 9,000 percent, according to the World Wildlife Fund (WWF). The non-profit conservation group Save the Rhino estimates that 1,054 of the animals were illegally killed in 2016. To battle this horrifying trend, biotech startup Pembient hopes to undermine black market sales by creating synthetic rhino horns that are practically indistinguishable from real horns, down to the molecular level. Pembient CEO and co-founder Matthew Markus thinks flooding the market with these synthetic rhino horns will be more effective than simply trying to stop rhino poaching. “If you cordon rhino horn off, you create this prohibition mindset,” he told Business Insider. “And that engenders crime, corruption, and everything else that comes with a black market.” He hopes that by increasing the overall supply of horns, his company’s synthetic horns will lower the incentive for poachers to kill rhinos for real ones. 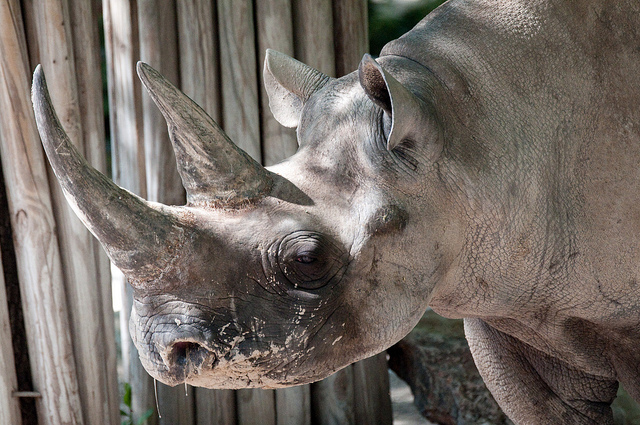 In part, rhino horns are popular thanks to their perceived medical benefits. Practitioners of traditional Asian medicine use powdered rhino horn for everything from hangover cures to cancer treatments. However, rhino horns are composed primarily of keratin, the same substance that makes up the hair on your head. A tea made from the clippings found on the floor of your local barbershop likely has the same healing properties as one of these horns. Despite the lack of evidence that rhino horns live up to the medicinal hype, however, they are still in demand, and while conservation groups acknowledge Pembient’s good intentions, some fear the startup’s plans to produce synthetic rhino horns may inadvertently drive up the price of genuine rhino horns, making them even more desirable as a luxury item. “On paper, the idea of flooding the market with ‘easy access’ horns in order to reduce demand is a good one,” Sophie Stafford, Communications Manager for Rhino Conservation Botswana (RCB), told Futurism. Unfortunately, it may not work so well in practice. The dire circumstances of rhino conservation have led to solutions with serious ethical complications — some conservationists have even taken to poisoning rhino horns to make any humans who ingest the horns sick. Even if such a drastic solution was effective, it would only deter the portion of the illegal market using the horns in medicine. It would do nothing to quell the continued sale of rhino horns for use as status symbols, either displayed whole or made into ornate artifacts and jewelry. Conservationists are embracing the advent of new technologies to help them more effectively preserve these at-risk animals. Some are embedding rhino horns with cameras and GPS implants to deter or catch poachers. A more lofty venture will place robotic rhinos within herds to protect the population. Any potentially helpful technologies that make it easier to protect rhinos from poachers should be considered. Still, conservationists will also want to make sure that any proposed changes do not have unintended consequences that will embolden these deplorable markets.